For those of you that don’t know, my stepdad, James, lost his battle with stomach cancer a little over a week ago (here). 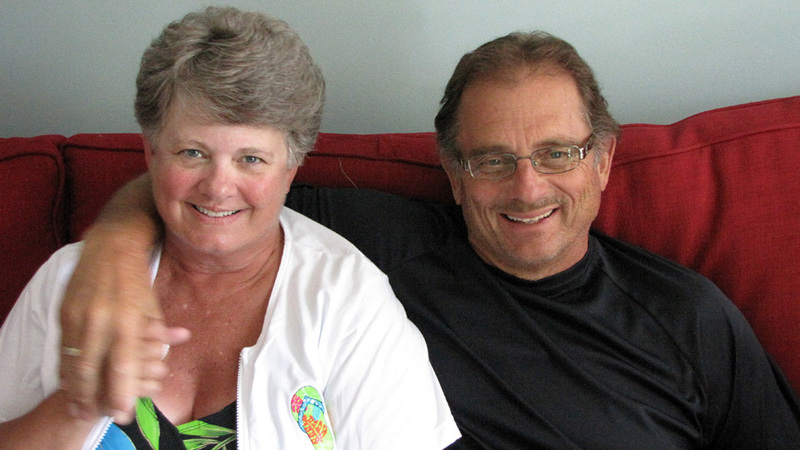 Tammy and I were in Tupelo last week, helping my Mom and spending time with my family. Instead of writing a detailed account of everything we did, I decided to do something different. Below is our trip to Mississippi, by the numbers. There were 19 lines per page and 29 of 30 pages in the book were filled. We didn’t take the time to count each name because there were a LOT of times were people filled out Mr. & Mrs. on the lines. Even if only 20% of those lines contained Mr. & Mrs. that would mean over 660 people came through. We heard from several people who couldn’t wait in the line at the visitation, which wound through the church and out the front door. The church where the funeral was holds 1,200-1,500 people and there was easily 750 people there for the service. I’d say there were well over 1,000 people who came to pay their respects. A truly amazing testament to how much James meant to the people he came in contact with. 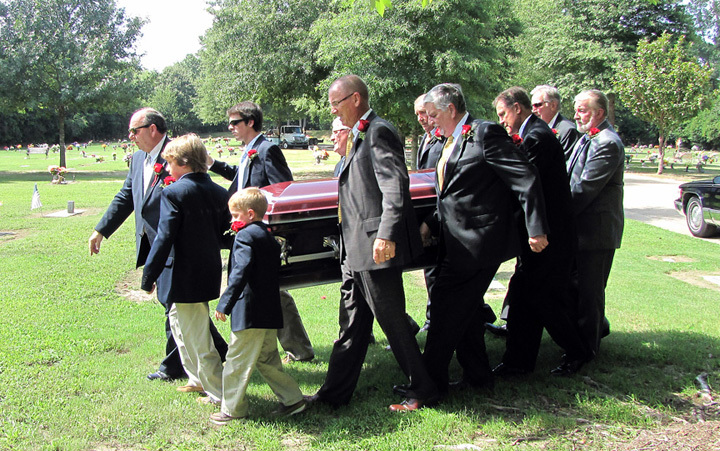 My three nephews, at the front, were pallbearers and helped carry James to the cemetery. 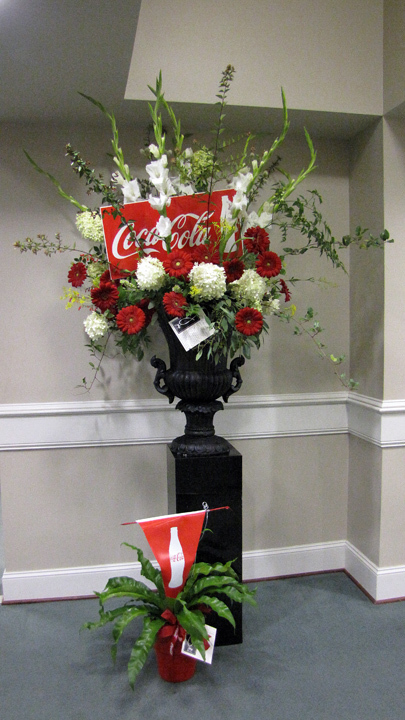 Coke sent this display of flowers in honor of James. There were so many plants that Tammy had to do inventory once they all got delivered to Mom’s. The biggest display, besides the roses mentioned below, may have been from Coca-Cola (right). James loved Coke and was a very loyal to them. Mom said that James would ask for a Coke when they would go out to eat and, when they asked if Pepsi was alright, James would ask for them to bring him sweet tea instead. I usually don’t mind when they offer Pepsi instead, but I told Mom that’s what I’m gonna start doing now, to help keep James’ Coke-loyalty alive. 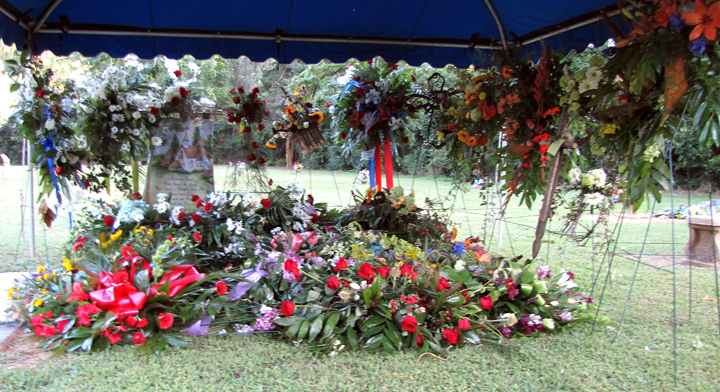 A few of the flowers that were sent in James’ memory. Betty was James’ sister who I had met before AND had spoken with at my Mom’s a few minutes before the visitation. Her daughters came through the line and introduced themselves to me. Daughters: Hi, we’re Betty’s daughters. Me: Oh, OK. I have no idea who Betty is. Tammy: (punching me in the ribs) Yes you do. Needless to say I didn’t forget who Betty was again. I wish I had thought to write them all down. I sat there looking at her thinking she was kidding and waiting for her to crack. It wasn’t until I realized that she wouldn’t have known to say “Shipley Donuts,” which we don’t have up north, that I jumped out of bed and ran to the kitchen. What? She almost drowned. If she REALLY had been drowning I would have prolly saved her. She’s always enjoyed swimming. Not what I call swimming, which is actually floating, but actually swimming, as in doing laps in the pool. She’s been saying she needs a racing suit for some time now, but it seems the list keeps growing every time we get in a pool. I only got to witness two of those, so maybe a racing suit isn’t a bad idea. 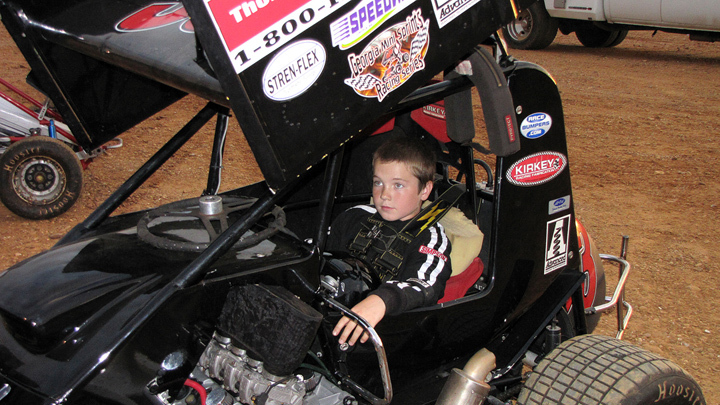 Rece waiting in his car before getting some practice laps in. 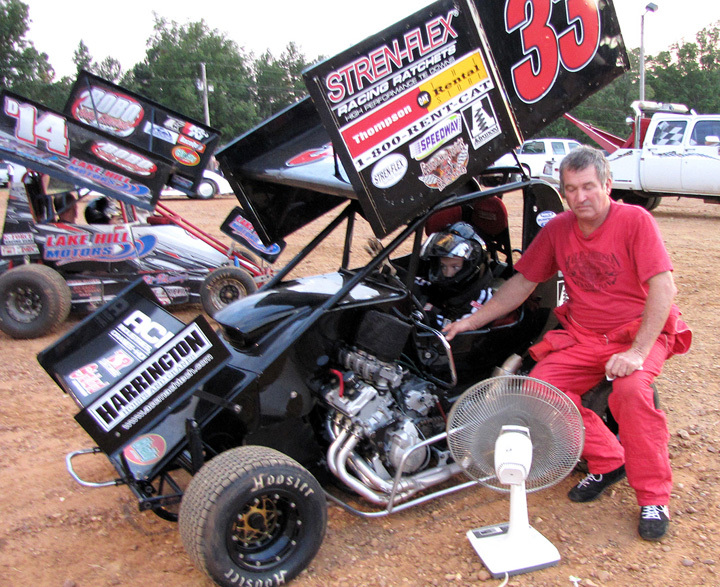 Once, by me, at a racetrack where my 10-year old nephew, Rece, was practicing for his race on Saturday night. Once, by Tammy, while walking through a neighborhood with new construction. Rece and Anthony go over some pre-practice instructions. Pieces of tape on the container of cookies we got from my sister’s bakery, Sweet Treats. The girl was going to put three pieces on but Tammy told her that “two would be fine.” The reason was because two pieces allowed her to get her hand in and out without actually opening the box. Her sweet concoction weighed the most of the four people who went, including my 12-year old nephew, Parker. I swear every time we changed the radio there she was singing. Someone told me she’s expecting and I have to wonder if she knows who the father is because she’s always singing about getting dumped. Number of times someone yelled “Go Dawgs” when I wore my Georgia Bulldogs shirt into a convenient store. I was floored by how many people showed up for him. Tammy and I could have had our wake/visitation and/or funeral at the same time and we wouldn’t have that many people show up. The visitation was sposed to start at 4 (actually started at 3:45) and I think it was around 4:30 Tammy leaned over to me and whispered. Tammy: My wake would be over by now. It was great hearing all of the stories from James’ friends and colleagues. He treated people with respect and wasn’t afraid to let people know he loved them. But the one thing that kept being brought up was how he always had a smile on his face. That smile will be missed by a lot of people, but no one more than my Mom. Gallery | This entry was posted in Daily Life and tagged Coca-Cola, Coke, daily life, humor, life, Music, postaweek2012, Tammy. Bookmark the permalink. It looks like James was an amazing person that will be missed by a community. You had a very full trip, I enjoyed your trip by the numbers. Hope you are doing well. Of all the times I was around James, played golf with him, etc., I can’t ever recall him saying anything negative about anyone or anything. Without a doubt, the most positive person I’ve ever known. I can only pray that one day I will have a “James” come into my life. His testimony inspires me to be a better person….to live larger, to forgive quicker, to love more deeply…to simply give more than I receive. I am beyond blessed to call his family my friends. Liked how you did this by the numbers. And James was obviously one of the good ones. Nice piece of work, Nephew!